Almost everyone worries about Alzheimer’s. It currently afflicts 5.2 million people in the United States and is the seventh leading cause of death. The cost of treating it is estimated at $148 billion. Mary Newport, MD, has been medical director of the neonatal intensive care unit at Spring Hill Regional Hospital in Florida since it opened in 2003. About the same time the unit opened, her husband Steve, then 53, began showing signs of progressive dementia, later diagnosed as Alzheimer’s Disease. She stated that: “Many days, often for several days in a row, he was in a fog; couldn’t find a spoon or remember how to get water out of the refrigerator”. They started him on Alzheime’s drugs – Aricept, Namenda, Exelon – but his disease worsened steadily. (It should be noted that the latest research shows that the various Alzheime’s drugs, like Aricept, have proven disappointing, with little real benefit and often distressing side effects.) When Dr. Newport couldn’t get her husband into a drug trial for a new Alzheimer’s medication, she started researching the mechanism behind Alzheimer’s. She discovered that with Alzheimer’s disease, certain brain cells may have difficulty utilizing glucose (made from the carbohydrates we eat), the brain’s principal source of energy. Without fuel, these precious neurons may begin to die. There is an alternative energy source for brain cells – fats known as ketones. If deprived of carbohydrates, the body produces ketones naturally. But this is the hard way to do it – who wants to cut carbohydrates out of the diet completely? Another way to produce ketones is by consuming oils that have medium-chain triglycerides. When MCT oil is digested, the liver converts it into ketones. In the first few weeks of life, ketones provide about 25 percent of the energy newborn babies need to survive. Dr. Newport learned that the ingredient in the drug trial which was showing so much promise was simply MCT oil derived from coconut oil or palm kernel oil, and that a dose of 20 grams (about 20 ml or 4 teaspoons) was used to produce these results. When MCT oil is metabolized, the ketones which the body creates may, according to the latest research, not only protect against the incidence of Alzheimer’s, but may actually reverse it. Moreover, this is also a potential treatment for Parkinson’s disease, Huntington’s disease, multiple sclerosis and amyotrophic lateral sclerosis (ALS or Lou Gehrig’s disease), drug-resistant epilepsy, brittle type I diabetes, and type II (insulin-resistant) diabetes. So Mr. Newport, not being able to get into the drug trial, started taking the coconut oil twice a day. At this point, he could barely remember how to draw a clock. Two weeks after adding coconut oil to his diet, his drawing improved. After 37 days, Steve’s drawing gained even more clarity. The oil seemed to “lift the fog”, and in the first sixty days, Dr. Newport saw remarkable changes in him: every morning he was alert and happy, talkative, making jokes. His gait was ‘still a little weird’, but his tremor was no longer very noticeable. He was able to concentrate on things that he wanted to do around the house and in the yard and stay on task, whereas before coconut oil he was easily distractible and rarely accomplished anything unless he was directly supervised. Over the next year, the dementia continued to reverse itself: he is able to run again, his reading comprehension has improved dramatically, and his short-term memory is improving. He often brings up events that happened days to weeks earlier and relays telephone conversations with accurate detail. A recent MRI shows that the brain atrophy has been completely halted. Let’s take a moment to consider what actually happened here. Synthetic (patentable) Alzheimer’s drugs have failed. A drug company reluctantly decides to put a non-patentable natural substance (medium-chain triglycerides derived from coconut or palm) through an FDA trial. It works. But, darn it, a smart doctor figures out that a natural food can be substituted for the super-expensive drug. Not only that, the ketones from natural coconut oil last in the body longer than the drug version eight hours instead of three hours. This is enough to make a drug company start worrying about its future. What if this natural health idea really catches on? Goodbye to monopoly profits! Some nutritionists and health professionals have called coconut oil the healthiest oil on Earth. You are probably wondering how they can say such a thing, given the bad rap the oil has gotten over the past decade. Have you read anything about coconut oil’s saturated fat content and how it’s bad for you? Well, research is now starting to show that not all saturated fats are equal. It turns out that coconut oil is unique in its structural makeup. True, it is the highest source of saturated fats of any of the oils, but these saturated fats include something very healthy. They are also the highest source of ‘saturated medium chain triglycerides? (MCTs). What exactly are MCTs? They’re fatty acids that are more easily digested by your body than other fats are. This means that MCTs can also be a direct energy source for you. Another important point is that 50% of MCTs are made up of ‘lauric acid’, which is the most important essential fatty acid in building and maintaining your body’s immune system. Apart from coconut oil, there is only one other source of lauric acid in such high concentrations: mother’s milk. Tropical oils and mother’s milk are by far the richest food sources of “medium chain fatty acids” (MCFAs). Milk fat and butter are the closest other source of these vital building blocks for our immune system. However, MCFAs make up about only three percent of the content of milk fat and butter. Any other vegetable oil is completely deficient in these MCFAs. Lauric acid has been proven in clinical trials to fight many viruses, including herpes, and HIV. If you’re still not convinced about the healthiness of coconut oil, keep in mind that the negative research that has been done on coconut oil in the past was more or less the result of one study. This particular study was done 40 years ago, and it used ‘hydrogenated’ oil. The oil that could help keep you healthy is virgin coconut oil – one that has not been altered from its natural form. If you’re still not sure about consuming saturated fat, research shows that some saturated fat is, in fact, necessary for your good health. Newer studies report that MCFAs help increase metabolism and are more easily digested than fats found in other oils. This is because they are processed directly in the liver, then quickly converted into energy. Therefore, there is less work for your liver, pancreas and digestive system to do. In one clinical study that was done at the University of Kelaynia in Sri Lanka (a population that has traditionally consumed a lot of coconut oil and coconut products), researchers tried to clear up some of the myths surrounding coconut and whether it is good for you or bad for you. Sri Lankans, by the way, call the coconut tree the ‘Tree of Life’. Coconut fats account for 80% of the fat intake among Sri Lankans. Around 92% of these fats are saturated fats. This has led, the researchers note in the study, to the belief that coconut fats are bad for health, particularly when it comes to heart disease. However, they go on to explain that most of the saturated fats in coconut are MCFAs whose properties and metabolism differ from those of animal origin. The researchers concluded that they are not as bad for health as saturated fats are, and actually have many benefits. Coconut Oil & Heart Disease? In another clinical trial, researchers wanted to discover if there was any link between the consumption of coconut and heart disease. The researchers noted that in many populations, high intakes of saturated fat are associated with elevated serum-cholesterol concentrations and in-creased coronary heart disease (CHD) mortality. However, several previous studies have reported that heart diseases are not common among populations who consume coconut, a source of saturated fat. The researchers constructed a case-control study in which participants with CHD were compared to gender-and age-matched healthy controls. Eligible subjects with CHD were identified through the cooperation of five participating hospitals. A total of 62 men and 31 women in the coronary (or ‘case’) group were recruited, along with 113 men and 76 women in the control group. The participants were required to answer questionnaires about food intake. The case group had significantly higher intakes of meat, eggs, sugar, tea, coffee and fruits, but lower intakes of soy products, rice and cereals, compared to the controls. Coconut consumption as flesh or milk was not different between cases and controls. The cases had significantly higher intakes of protein and cholesterol, but lower intake of carbohydrates. 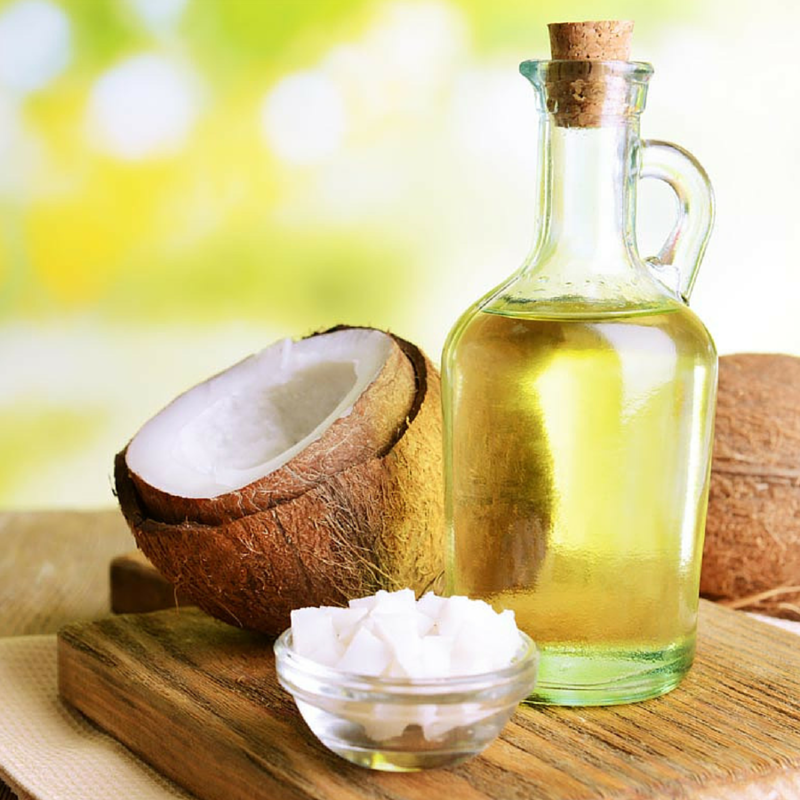 Similar intakes of saturated and unsaturated fatty acids between the cases and controls showed that the consumption of total fat or saturated fat, including that from coconut, was not a predictor for heart disease. However, the intakes of animal foods, total protein, dietary cholesterol and plant-derived carbohydrates were predictors of heart disease. So give coconut oil a try. Make sure that you buy virgin coconut oil, not the hydrogenated kind! Most health-food stores keep good-quality coconut oil on the shelves – but give your regular grocery store a try first. The bad press for coconut oil is finally starting to be disputed, so more and more stores have begun carrying this healthy oil again.